South Africa’s legendary batsmen AB deVilliers announced his retirement from all formats of International Cricket today. He posted a video in twitter about his retirement. You can see the video below. He mentioned that he is tired and it is time for giving opportunity to other player. He left everyone in shock with this sudden retirement plan. All the fans expected ABD to play in 2019 ICC world cup. He is one of the Legend with over 50+ average in Test Cricket. ABD secured 22 centuries and 46 fifties in his entire International career. He holds the record for Fastest Fifty, Fastest Century and Fastest 150 runs in ODI cricket history. He is awarded with ICC Player of the year 3 times. In total, ABD scored 20,000+ international cricket runs across all formats of the Game. 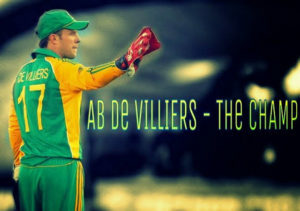 AB deVilliers is regarded as one of the best batsman in the modern cricket era along with Indian Captain Virat Kohli. Recently we’ve seen his phenomenal batting performance in IPL 2018. Prev Which Team can Qualify to Playoffs?